Looking for an easy way to geo-target affiliate links on your WordPress site? Have different domains for different regions. Amazon is the best example of this - you have amazon.com, amazon.co.uk, amazon.de, etc. Amazon affiliate geo-targeting is a very common strategy to address this and boost commissions. Don't accept traffic from all regions. In this case, sending traffic from a restricted location is just a waste. Using geo-targeted affiliate links, you can send that traffic somewhere else. By learning how to geo-target affiliate links, you're able to always send traffic to the best-converting offer for their region. That means higher conversion rates and more commissions for you. If you want to create geo-targeted affiliate links on your WordPress site, you'll need a plugin, though. In this post, you'll learn how to use the Geo Links plugin from Geotargeting WP to geo-target any type of affiliate link from any platform. 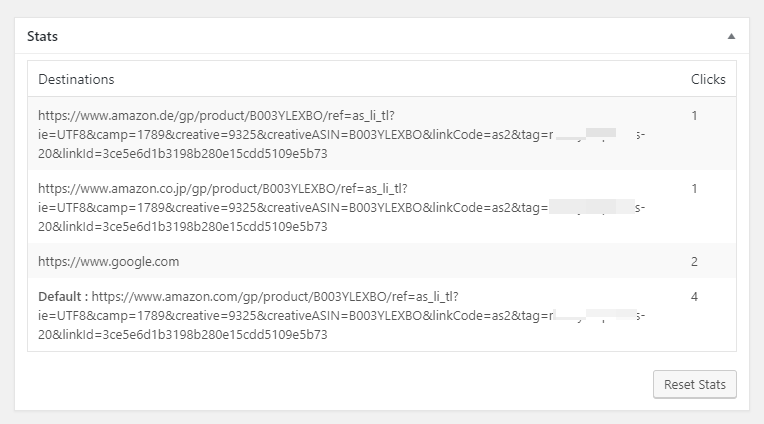 We'll use Amazon affiliate geo-targeting for our example, but you can send traffic to literally any URL. 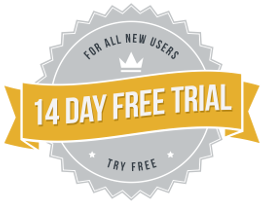 The Geotargeting WP service offers a 14-day free trial, so you'll be able to follow this entire tutorial without needing to pay anything. When you go to create a new affiliate link, you can choose one destination URL to act as the default destination. 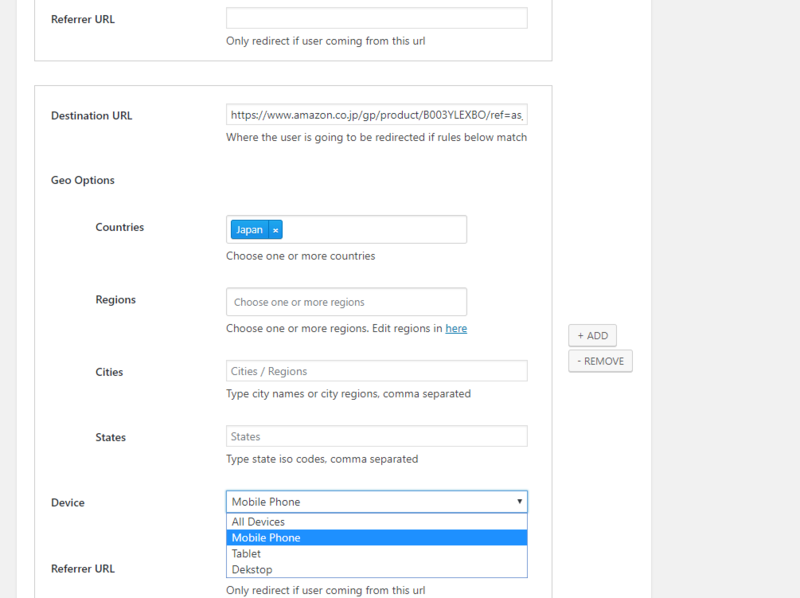 For example, if you want to geo-target Amazon affiliate links, you could make your default link go to amazon.com. 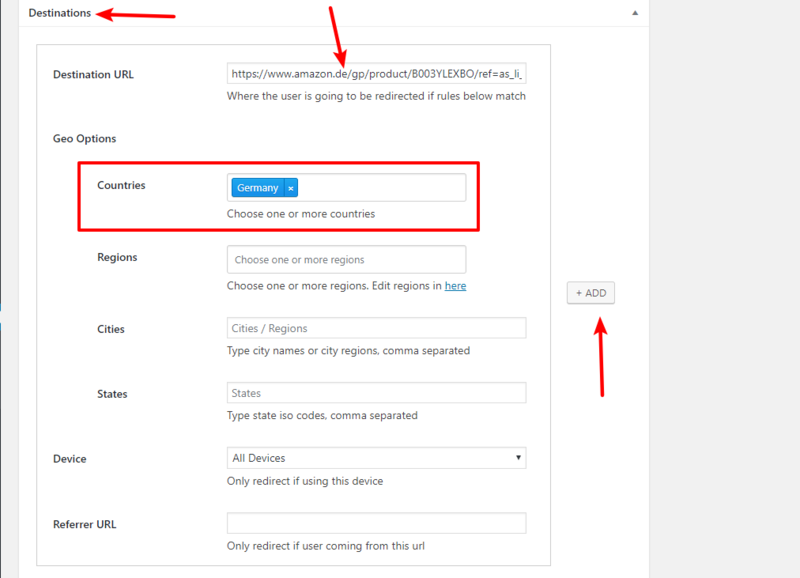 Then, you can add as many geo-targeting rules as you want to handle specific regions, countries, states, or cities. Make the default destination URL amazon.com except if a visitor is from…. The UK - send them to amazon.co.uk instead. Germany - send them to amazon.de instead. Japan - send them to amazon.co.jp instead. You get the idea - you can create as many geo-targeting rules as needed. You can also build unlimited affiliate links, each with their own unique sets of geotargeting rules. To get started, you'll need to sign up for a free Geotargeting WP account and download the free Geo Links plugin. Again, you get a 14-day free trial, so you won't need to pay anything to follow this guide. Once you download the plugin, install and activate it at your WordPress site. You can also choose whether or not to enable the stats functionality for your links (you'll learn how stats work at the end). Now, you're ready to create your first geo-targeted affiliate link. First, give your link a descriptive title. This is purely internal - it just makes it easy to remember which affiliate link is which once you've added a lot of different links. Redirection code - the default 302 is a good option most of the time. But you can change it if needed. Default URL - this is the default affiliate link that you want to send people to. 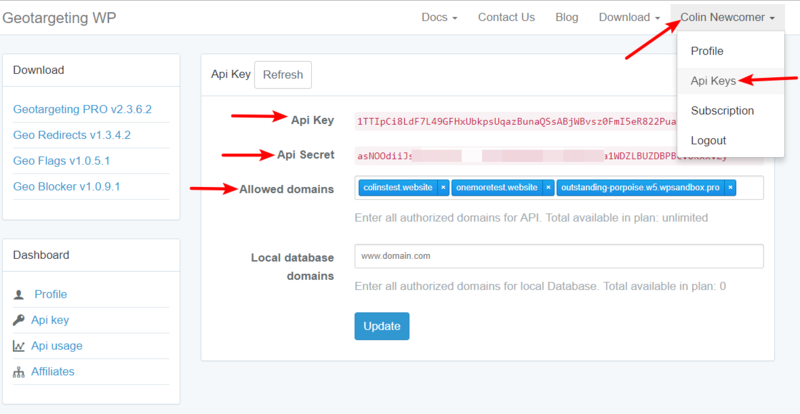 Any visitor who is not in one of the locations that you specify in the next step will be sent to the default URL. For example, if you're an Amazon affiliate, you would probably want to make the default amazon.com. 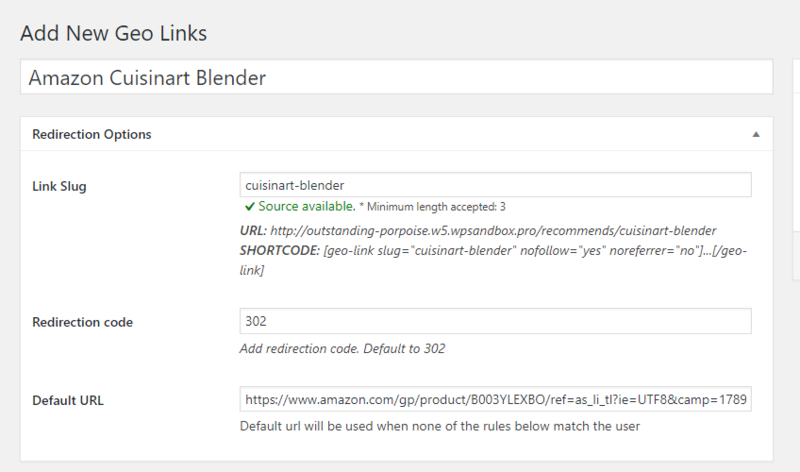 Next, you can use the Destinations area to add different destination URLs for users that match specific criteria. You can also target by specific devices or referring URLs. You can also use that ADD button to create multiple rules for different locations. There's no limit on the number of destination rules that you can have - so feel free to add as many as you desire. Additionally, the different destination URLs do not have to share the same domain name. Get as creative as you need to maximize your conversion rates and revenue! When you're finished, make sure to Publish your link. And that's it! All you need to do is repeat the process for the different geo-targeted affiliate links that you need to add. Before we finish this article out, we'll show you one more thing. By using geo-targeted affiliate links at your WordPress site, you're able to make sure that visitors always get sent to the affiliate offer that's most relevant to their location. Ready to get started? Head to the Geo Links plugin page to learn more and start your free trial.